I am new to the world of food. That is not to say that I haven’t enjoyed food. Immensely. Up to this point. Rather, I am new to appreciating it genuinely. Slowly. Unusually enthusiastically. Academically (?). I would like to say that this new approach manifests itself in a graceful way. Picture: me, sitting straight-backed, with curious eyebrows and half-closed eyes, smiling while savoring. Sadly, this is not the case, as my oft-aching and stuffed belly will attest. You can find these tasty treats, as it turns out, at Boston favorite El Pelon. Yet, awesomely, making them at home is easier than getting in the car. Thank you to my friend Mannie and Latin America for bringing us this summer classic that perks up any sleepy dish. 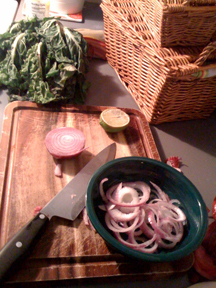 With a sharp knife, slice the onion very thinly. Place onions into a bowl and add enough water to cover. Add salt and soak until onions are very tender (30+ minutes). Drain water thoroughly (don’t rinse!) and squeeze enough lime juice into the bowl so that onions are soaking. * what I affectionately call a “bachelor’s bean dip” (i.e., can of beans, salsa, grated cheese,sour cream/Greek yogurt). Just because it wouldn’t feel right to leave it out….organic, local ingredients are the tastiest, and, in buying them, we put our money where our hippie mouths are. ← The beginnings of my artistic career! And my career as a lesbian.